The traditional dragons wind their way ceremoniously down Commercial Street during last year's parade, presented by Community Asian Theatre of the Sierra. 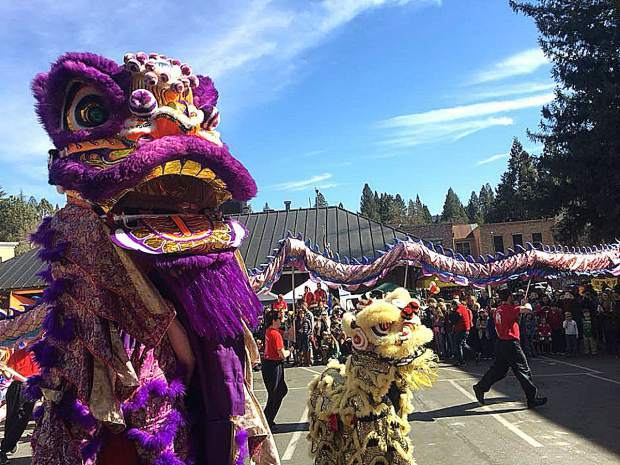 The Nevada City Chinese Lunar New Year Festival and Parade welcomes the Year of the Boar, on Sunday afternoon. Chinese New Year Festivals are rare in rural communities, and Community Asian Theatre of the Sierra (CATS) is proud to present this eighth annual family-friendly celebration, honoring the early Chinese Gold Rush pioneers and railroad workers of the Sierra. In May 2019, Americans will celebrate the 150th anniversary (the Sesquicentennial) of the completion of the Transcontinental Railroad in Promontory, Utah. The railroad revolutionized travel from one end of the United States to the other. A significant portion of the labor force were Chinese immigrants, who helped build the Central Pacific Railroad (the western portion) of the grand Railroad in the 1860s. As we honor these early immigrants, we hold dear the contributions of all immigrants to this great country of ours. Stop by the CATS booth staffed by historian, filmmaker, and journalist Bill George of PBS fame to learn more about the Chinese and the railroad. He will have DVDs and books for sale for adults and children. The community parade begins at noon from the Chinese Monument, located at the entrance to the parking lot on Commercial Street, the site of the old Chinese Quarter. Chinese ceremonial Lion Dancers and a 72-foot Chinese dragon from Eastern Ways Martial Arts of Sacramento will prance down Commercial Street, with Grass Valley Taiko drummers, school children, martial artists and other community entries. The mini-parade will end at the Three Forks Bakery and Brewery parking lot, where the Lion Dancers and Dragon dancers will spearhead an afternoon of Asian culture and entertainment. Food will be available for sale by Kaliko’s Hawaiian Kitchen and homemade desserts by Xiao Mao (Little CATS Culture Club). CATS is pleased to honor Erin Thiem and Dan Thiem as the Grand Marshals in the parade. They are the owners of Outside Inn and Inn Town Campground in Nevada City. Erin is passionate about all things Nevada City and writes a weekly blog for the Outside Inn on things to do in our area. She loves capturing life in our small town and sharing with folks near and far. Dan is happiest while working on a project, but he can be found at the campground helping customers or fixing things at the motel while continuing his volunteer work for the Nevada City Cub Scouts and the Forest Charter School Board. The Outside Inn is thrilled to have celebrated its 20th year in 2018 as a family-run business, with Erin and Dan owning the business for the last eight years. The Inn Town Campground was a labor of love that Erin and Dan built from the ground up; it opened for business in the summer of 2016. The campground offers a mix of tent camping, glamping and RV sites for folks to enjoy a camping experience in the heart of downtown Nevada City. CATS will have a mini yard sale of its props from various shows at their booth. Alas, it has come time to clean house after 25 years. Come on by the CATS booth and pick up a “treasure.” Donations are accepted, which support our annual festival and parade. Many thanks to our entertainers who have returned annually. They include Eastern Ways Martial Arts of Sacramento (Chinese Lion and Dragon dancing), Grass Valley Taiko (traditional Japanese Drumming), Ka Hale Hula O Pilialohaokalani O Hilo (Hawaiian Hula), Body Balance (Kung-Fu), Fa Lun Dafa (tai chi, qigong, and meditation) and Xiao Mao (musical presentation). The parade is weather permitting. If there is heavy rain on Sunday, the event will be cancelled. Check updates on http://www.catsweb.org and on Facebook. Announcements will be made on KVMR and KNCO radio stations if it is cancelled. Exhibitors and vendors will populate the parking lot at Three Forks. Parade entries, entertainers, sponsors and volunteers are still being sought. Contact Jeannie Wood at info@catsweb.org. 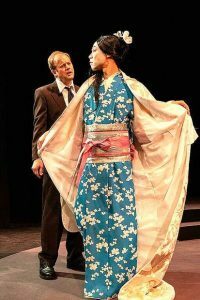 The event is a cultural enrichment program of the Community Asian Theatre of the Sierra (CATS). See http://www.catsweb.org.